I've had a pretty crappy time over the last two weeks, so to cheer myself up I'm doing a completely silly top ten. 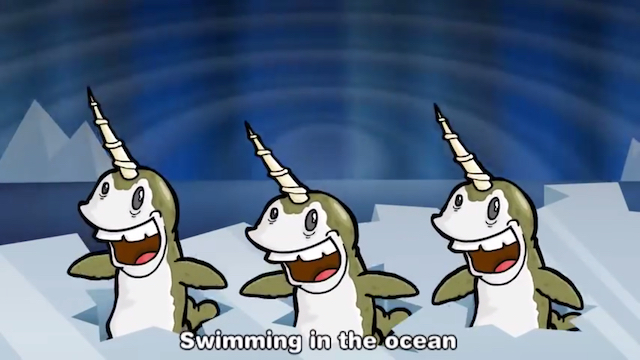 You'll probably have wanted a hip-hop artist and we'll get back to that I promise, but now for completely selfish reasons I'm going to sing a song about narwhals. Why narwhals? Because they're the inventors of the shish kebab, of course! 2.) MrWeebl - "Shrimp Glockenspiel"
3.) MrWeebl - "Bacon (The Bacon Song)"
4.) MrWeebl - "Business Cat"
5.) MrWeebl - "Russian Dancing Men"
7.) MrWeebl - "Owls Hate Simon Cowel"
8.) MrWeebl - "Jazzwhals: A Narwhals Jazz Remix"
9.) MrWeebl - "Save the Badger Badger Badger"